“Robot Suit HAL” is a cyborg-type robot that can supplement, expand or improve physical capability. When a person attempts to move, nerve signals are sent from the brain to the muscles via motoneurons, moving the musculoskeletal system as a consequence. At this moment, very weak biosignals can be detected on the surface of the skin. “HAL” catches these signals through a sensor attached on the skin of the wearer. Based on the signals obtained, the power unit is controlled to move the joint in unison with the wearer’s muscle movement, enabling HAL to support the wearer’s daily activities. This is what we call a ‘voluntary control system’ that provides movement interpreting the wearer’s intention from the biosignals in advance of the actual movement. Not only a ‘voluntary control system’ “HAL” has, but also a ‘robotic autonomous control system’ that provides human-like movement based on a robotic system which integrally work together with the ‘autonomous control system’. “HAL” is the world’s first cyborg-type robot controlled by this unique Hybrid System. “HAL” is expected to be applied in various fields such as rehabilitation support and physical training support in medical field, ADL support for disabled people, heavy labour support at factories, and rescue support at disaster sites, as well as in the entertainment field. “HAL” has two control systems which work closely together. When a person attempts to walk, for instance, the brain sends electrical impulses to muscles. when they arrive at muscles, faint bio-electrical signals appear on skin surfaces. “HAL”’s system works as described below. Faint bio-electric signals are observed on the surface of the skin. Power units generate torque and put limbs into action. Thus, HAL assists the wearer with an intended movement. 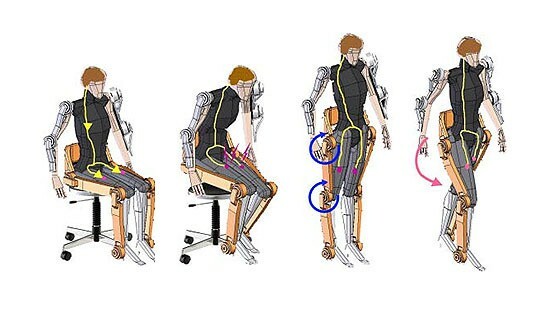 A human motion (for example standing up from a chair) can be recognized as an aggregate of several elemental movements. It is similar to a sentence that consists of several words. For a given motion, “HAL” assembles small movements from the database, just as words from a dictionary are concatenated to form a sentence. Using the database (which is also automatically augmented by the information that sensors collect from the body) “HAL” autonomously coordinates each motion to be assisted smoothly by power units. Furthermore, in the case that no good bio-electrical signals are detectable due to some problems in the central nervous system or in the muscles, “HAL” can be of use through the Robotic Autonomous Control.